Well, got most of the nasty bugs out. What are the chances I missed something? Well, hopefully it won't be anything serious. Hyperspace 3 is now out! Grab it in the levels section. Haven't really made many diary entries, since I don't tend to give away my secrets ;-). But if there is something in particular you want me to comment on (in regards to modding/editing Hyperspace), for example "How did you do that?" , drop me a line and I'll put it up. 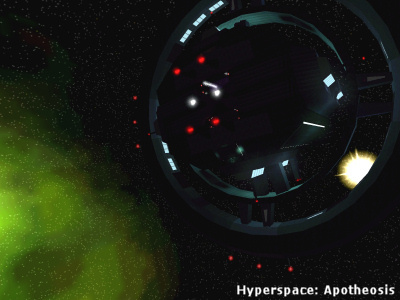 You can now track the (slow) development process of Hyperspace 3 over at PlanetDescent. You can also find some pictures and video clips from the robot testing. A direct link to the thread can be found by clicking here. Ok, I know there hasn't been any updates, but until recently all my recent projects were put on hold. 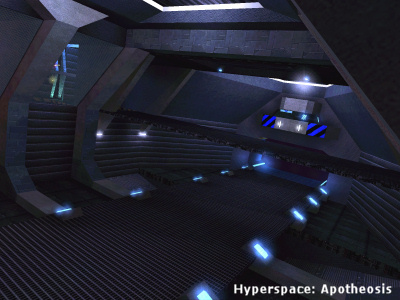 But you may be interested to know that I have finally resumed work on Hyperspace 3, which is about 50% completed. It might take a lot longer to finish the remaining fifty percent, however. 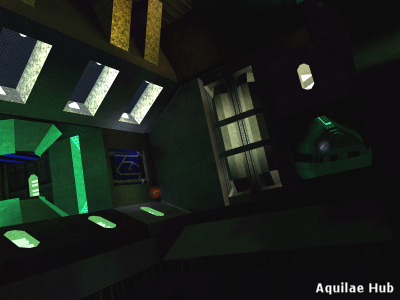 More details on the level will be available soon, and assault is definitely going to be a big part of it. Work has officially begun on Hyperspace 3, currently a working title. 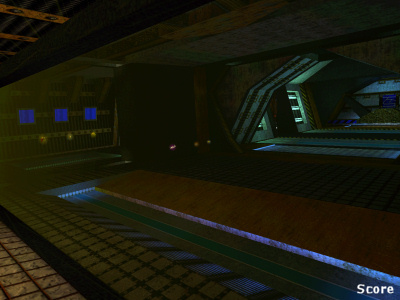 This level will be the final level in the Hyperspace set, and will be bigger and larger all the same. Already the blue base is nearing completion, with the red base and exterior models to be done after. Some new weapons will be included aswell as miscellaneous updates to sounds and models, expect more details on those later. The interior of each base shall be more equal and have some symmetrical parts, but not entirely. The exterior models will be a fair bit larger to accomodate the interior, but no jumpgate is planned as the level boundry isn't larger enough to support two starfield environments that look any good. Some surprises are planned for this level, such as an automatic defense turret for each team! Although Assault is also planned, I will not be working on any Assault scripting or models until after the standard CTF level has been released. This way I can cut down the size of the standard level and expand on the Assault version. Well, the Assault scripting and events have been completed - Over the past two days I've been trying to solve the same damn bug, and I finally cracked it down tonight. Apparently the L10 Swatter turret doesn't like being referenced, and after a period of time (usually after the turret activating, firing and killing you at least once) the game will crash to desktop. I had to go through a hundred games to isolate it, because it crashed in the strangest manner - Half way between bases after respawn, heading back to take it on again. That threw me off a lot, because I was looking at possible data-overloads, scripting errors, or even some unseen level problem. Hell, I still don't feel sure it's fixed. So I'm going to do a public test tonight, and if all goes well - I'll wrap it up and distribute. Most of the "Score" level has been completed, design-wise. All I have to do now is add weapons, playerstarts, any minor changes and additions that I might put in. I expect to have some testing done today to see how it plays - I'm gonna see how the game goes with normal weapons and Hyperspace weapons. 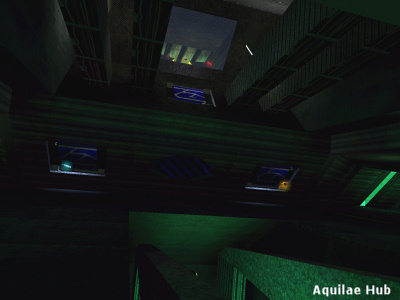 It all depends on what the testers think of the level with such modifications. Until then I might work on adding some scripted vents and things. It might be all done this weekend, as you know I don't take long working on levels. I tend to design the whole thing within a few days, then slow down as I reach completion. Well yesturday I finally started on a new level. 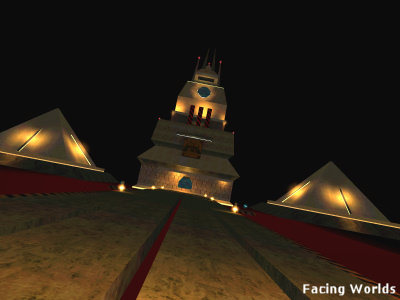 Score will be a medium CTF level with plenty of room for fights, without too many obstacles. I have taken the idea of using the Proving Grounds texture theme, since no one seems to have used those very often ! I might throw in all the weapon MODs from my levels in this, so I ask you leave a message and tell me what you think about that. Over the past two days I've been working on balancing out the Hyperspace weaponry somewhat. You can now play it in CTF without the extreme amount of power that each weapon had. Everything has been changed, including some eye-candy and sound balancing to prevent crashing. If it works or not I'm not sure, but the crashes have definitely been reduced. Well NYSA has been released and pretty much wrapped up, may come back to it later for a possible 1.1. I've now moved onto a "Spur-Of-The-Moment" project; that being an awaited sequel to Luminous. 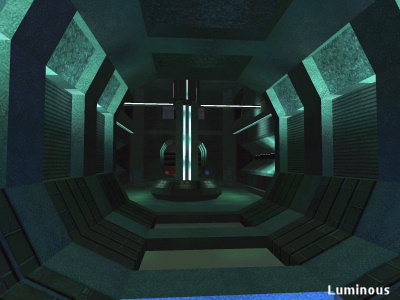 "Hub" will be another CTF map, but it's design is very different from Luminous - But the theme will remain the same. So far this level has turned out better than I expected. I'll have this wrapped up by the weekend. That's why I call it Spur-Of-The-Moment. As you can see from the screenshot the architecture is pretty interesting, while at the same time not having anything getting in the way; IE Criticus. The lighting on the screen is quite different from in-game. You'll just have to wait and see. No mods are planned. Around about thirty players have now tested NYSA. I've done some little tweaks, such as changing around powerups, and decreasing the size of the grid with Mega Missiles inside it inorder to promote more fighting space. Thanks to Hemp for the heads up, or I'd of likely forgotten it. To the right you can see the rather spiffy loadscreen I've taken for NYSA. After some final lighting routines and calculations, the level maybe ready today. After a nice project file clean up, I got back to work on NYSA today (Wednesday and Thursday are the most available days to work on things..). I've pretty much finished off the design of the level, with eye-candy and lighting almost finished. At the moment I'm trying to decide if to use Volumetric lighting in this place, since it's, in places, a very dark mine which causes the "Black Ships" in the corner. This may not be a problem however when I do the final lighting jobs, which will use less ignore limits. The level should be ready for an early BETA test today. I'll just pick some players when I'm online. Finally got around to resuming work on NYSA. I hadn't done anything for two whole days. Both Monday and Tuesday are the longest College days of my week, thus I don't get any time to do much of anything. After a slow start, I finally completed a room with some details and connected it to the level. It's amazing how slow you can work sometimes, almost like a drag. Sometimes building levels can be really boring work, even if you are pleased with the level or not. This is the main reason for not bothering with Hyperspace 3, it's just too much work - Work that I've already done, debugged, and so forth. Maybe in the future when the time is right. For now, it's just a few little things here and there. Back to NYSA. 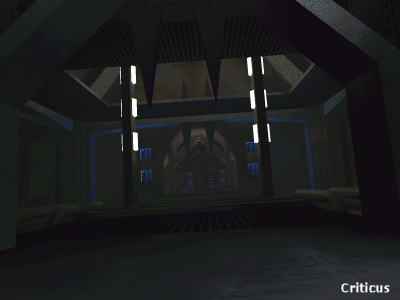 Currently I'm working my way through the Reactor Hall, which is connected to the soon-to-be-built Reactor alcove. 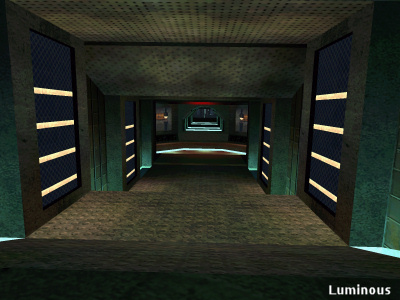 Most of the level has been completed, lighted and "painted" with detail. Despite a few fancy-bits, most of this level is low-poly - Making it my "least" detailed level to date, probably. 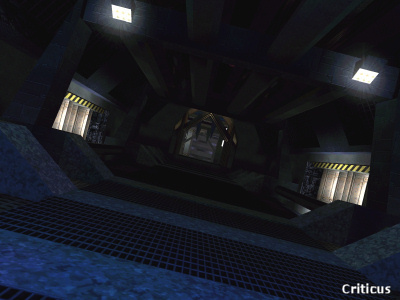 The texture theme and lighting has been kept concurrent throughout the level, with only slight deviations. Another update later perhaps.